During the course of our participation in the 2018 iGEM Competition, we started communicating with many other teams, from our country and also from all around the world. Through talking and exchanging ideas we managed to help each other improve our projects. But also, those collaborations made us realise that the iGEM Competition offers more than just the experience of competing. It offers us the chance to connect with people who see the same subject, synthetic biology, in a different perspective than ours. We hope our collaborations benefited others as much as they did us and that in upcoming years Greek teams will be able to participate in more European and global collaborations. You can view our fellow iGEM Teams’ wikis by clicking on the headings. 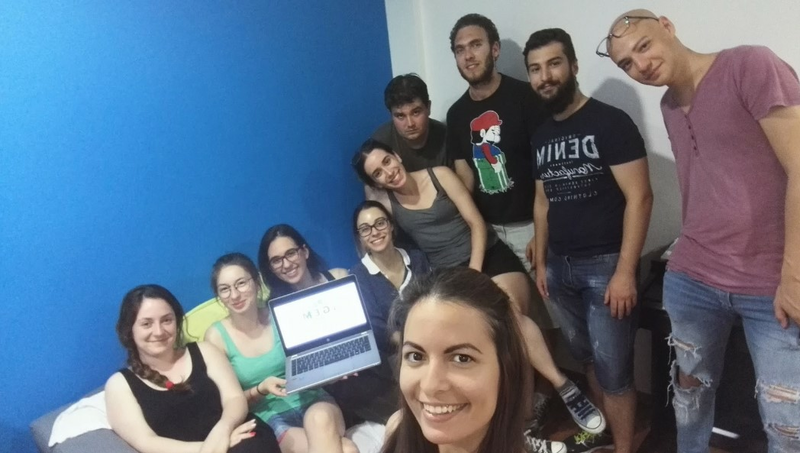 Trying to engage in more meaningful collaborations with other iGEM Teams, our team took the initiative to host the members of a team in our city Athens, Greece for some days during the summer months. We came in contact with a lot of teams, but we ultimately managed to host only the iGEM Bulgaria 2018 Team, which also works on a diagnostics project, similar to ours. Before hosting iGEM Bulgaria in Athens, we had a series of Skype sessions, in which we discussed and exchanged opinions on our projects. In one of these sessions, we broached the subject of reporter proteins, such as Horse Radish Peroxidase (HRP) and Green Fluorescent Protein (GFP) and we examined their advantages and drawbacks. Their feedback was significant in helping us settling down to our current reporter protein. During the team’s visit in Athens at July 23-26, we both presented our work and had an in-depth discussion on our projects, focusing on what difficulties we have had or we might have in the future and how we could have a meaningful collaboration that could promote both our projects. At that specific time, we were in the process of designing the assembly of our parts. Slavil, the iGEM Bulgaria’s team instructor, provided us with insight on the matter, by giving us helpful tips on primer design and different assembly methods. We also discussed about possible opportunities of comparing our work and validating each other’s project by exchanging targets and compare our results on the diagnosis, an idea that was never realized, due to time limitations. Also, since the iGEM Bulgaria team did not participate in the InterLab study and our team was short on silica beads, they were willing to send us their own, which would arrive faster than those send by the iGEM Headquarters. Thanks to their immediate response, we were able to complete our InterLab study in time, without any problem. Finally, we had a great time showing the team around our city and we presented them our lab space and our University’s campus! Through our communication with the only other team from Greece this year and with the help of Dr. Konstantinos Vavitsas (University of Queensland) we came up with the idea of organizing a workshop in order to introduce Synthetic Biology to a wider audience. 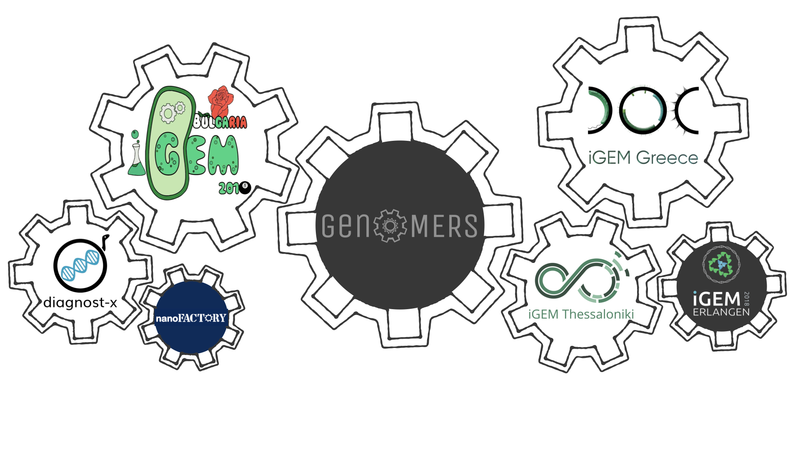 The “SynBio Workshop: The principles of engineering life” was held at the National Technical University of Athens and throughout its course we collaborated with the team members of iGEM Thessaloniki 2018. We worked together in order to create the educational material for the presentations and to find donors for the event. 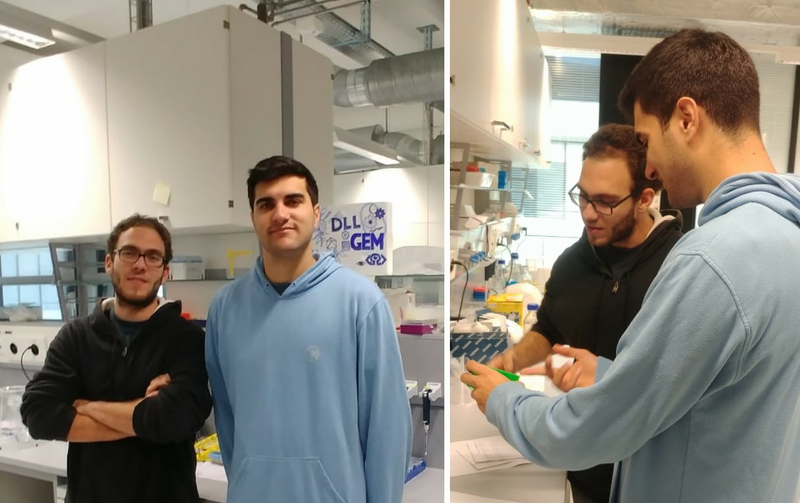 Two members of the iGEM Thessaloniki Team came to Athens to provide hands on assistance during the final steps of setting up and executing the workshop. Since none of us had any previous experience organizing such a huge event, it was truly a valuable collaboration and through it we managed to overcome many issues that arose and acquire new skills. Since only one undergraduate team from Greece had ever participated in the iGEM Competition, when we decided we were interested in participating ourselves, we had a plethora of questions concerning many aspects of the process. The iGEM Greece 2017 team members were quick and eager to answer all of our questions and give us guidance through the first months of setting our team up. Also, as the iGEM Greece team members had more lab experience, they gave us useful tips and helped us many times with troubleshooting. 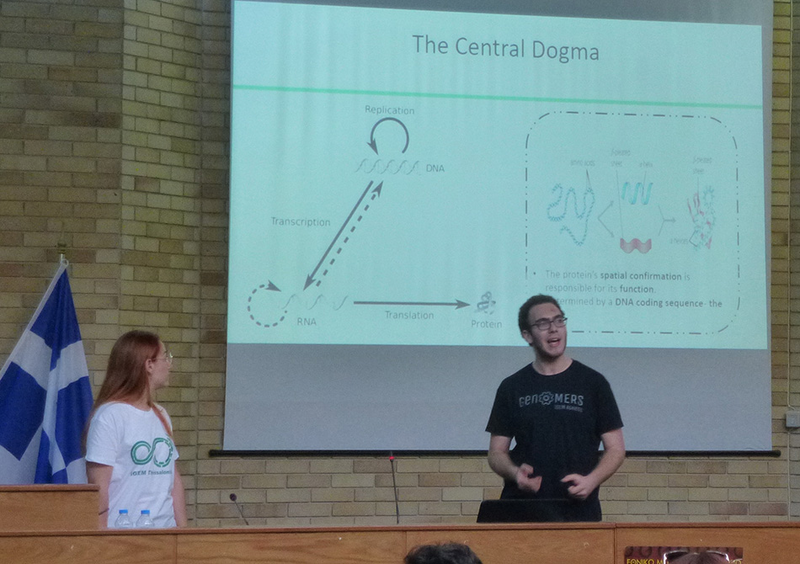 The iGEM Greece 2017 Team also participated in the SynBio Workshop by presenting their project. The Berlin diagnostX 2017 Team had a very similar project to ours, so they were in a unique positions to give us more information about the toehold switch mechanism. The team, and especially their team leader, who continued working on their project, gave us tips about the design and the assembly of the switches and generally about many wet lab issues that we came up against. The Bielefeld-CeBiTec team shared with us a slide-show they prepared about Dual Use and Research of Concern. They informed us on these topics in the context of science and explained how they form a part of Biosecurity issues. We supported their commendable effort to raise awareness on such important topics by viewing the slides at the Molecular Virology Laboratory of the Hellenic Pasteur Institute where we conduct our experiments. 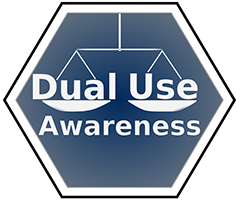 The Bielefeld-CeBiTec team granted us the Dual Use Awareness button. Both team Erlangen and our team created a video for their Human Practices. In order to make it accessible to more teams and people around the world, our teams translated each other’s video script in their own language, so that the translated script can be used as subtitles. Thus, our video has German subtitles, and iGEM Erlangen Team’s video has Greek subtitles! Having just started our iGEM journey, we sought out for teams with previous experience on the diagnostic mechanism we had chosen: the toehold switch. We initially contacted the iGEM EPFL team in order to work as a liaison with Aptasense, the previous year’s team. Yet, that was only to find out that we share much more in common than what we initially thought; cell - free systems utilization and materialization of a diagnostic kit stands in the core of both of our projects. That stood as the beginning of a meaningful collaboration. The EPFL team shared with us their expertise on cell-free system optimization and provided insightful tips on our experimental design. From our part, we assisted the EPFL team set the basic lines and specifications for their kit design. Throughout several skype calls during this summer, we tried to identify the key characteristics our suggested mechanisms should enclose, as well as the needs we should address. Yannis had the chance to meet in person with the team, spend time in the lab with them and discuss future collaboration plans. Since both teams are planning to keep on working on their projects after the course of the competition, we decided to set a common timetable on realizing our kits. To this end, we will evaluate if parts of our kit could be 3D printed and put together to a final product. During the summer months, many team members from other iGEM Teams visited our city, Athens in the frame of their summer vacation. When they contacted us, we were quick to set up a meeting in order to know each other and talk all things iGEM. We had the pleasure of meeting with Nicholas Kakaroubas from the UNSW 2018 iGEM Team. We presented each other with our projects and gave feedback on the enzymatic issues we shared. We also gave Nick a tour of one of the labs were we work and spend a day doing lab work together, while we exchanged many wet lab tips. Our team also met Alexis Casas from the iGEM Paris - Bettencourt Team with whom we had a very interesting conversation about our projects! iGEM Bulgaria Questionnaire: Survey concerning CRISPR, GMOs and our view about them. iGEM Dusseldorf: Survey about probiotics. iGEM Montpellier 2018: Survey concerning contraceptive methods and the possible use of engineering bacteria for this purpose. UNAMBG iGEM 2018: Survey about antibiotic resistance.